Born and raised in Liverpool, Tony now enjoys the beautiful Cheshire countryside surrounding his home in Kingsley. After working in Liverpool for The Prudential for over 30 years he turned to his long suppressed passion for art. At age 55 he attended Liverpool City College where he achieved GCSE and A Levels and subsequently emerged from Wirral Metropolitan College aged 58 with a B.A. Honours Degree in Fine Art. Tony was approached by Lever Faberge to supply 3 large sculptural panels and they are in their permanent collection at Port Sunlight. His work has been included in Southport's Municipal gallery, The Atkinson and sites alongside the work of such luminaries as Henry Moore, Alfred Munnings and Elizabeth Frink. He has recently been accepted into the Society of Wildlife Artists and included in 'Who's who in art'. Tony is currently working on two life size flying swans to be cast in bronze for David Wilson Homes in Cheshire as well as awaiting planning permission to install a life size Pegasus in Liverpool as part of 2008 Capital of Culture celebrations. He has enjoyed fellowship and residency placements and is currently Artist in Residence at Northwich's London Road College. 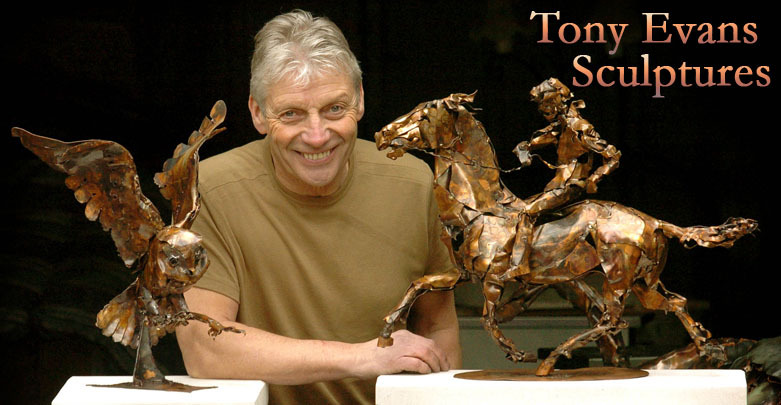 Constantly exhibiting throughout the country Tony has recently embarked on another series of limited edition bronzes.